Have you ever had serious concerns with the way your solicitor has dealt with your case? For instance, do you believe your solicitor has not respected your confidentiality, or do you believe that your solicitor has been overcharging you? If so, have you ever thought of filing a formal complaint against the solicitor? Interested in finding answers to these questions? This paper will provide you with the answers. In the 2008 Bar Association of Queensland Annual Report, John Briton the Legal Services Commissioner stated that there is an average of over 1200 formal complaints a year against a legal practitioner or about one in every six Queensland legal practitioners receiving a written complaint. If you believe that your legal practitioner has performed unsatisfactorily under his professional duty then you have the right to file a complaint against him. Provided below are details on the avenues available to lodge a complaint against your legal practitioner and how to go about the processes of lodging a complaint. 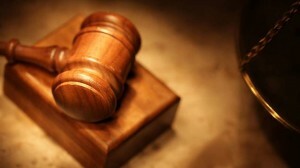 There is a respected body that deals with the complaints against legal practitioners in each state and territory, thus this has to be taken into account, however each statutory institution performs similar roles and investigates similar matters or issues in regards with unprofessional actions of a legal practitioner. Who is a legal practitioner? A legal practitioner can be a lawyer certified to work as a barrister or solicitor. In some states, such as Queensland, law-practicing employee also counts as a legal practitioner. The lawyers’ special responsibility is to give their best service to their client with professionalism, as well as their special duty to the court. Where do I go to file a complaint against my legal practitioner? What would be my underlying reasons to file a complaint against my legal practitioner? If you believe that your case falls within the scope of a “consumer dispute” or “conduct complaints” then you have reasons to complain against your legal practitioner. 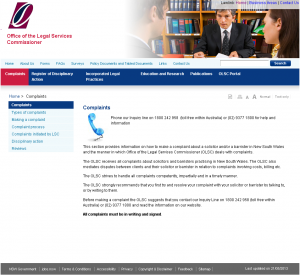 Under the Legal Profession Act 2004 (NSW), “consumer disputes” may be in regards with delays, costs, poor communication or rudeness or a release of your documents or property (liens). A “conduct complaint” is associated with “unsatisfactory professional conduct” or a “professional misconduct”, this could be a threatening or abusive behaviour, failure to comply with an undertaking, poor advice or representation, serious delay, non-disclosure of costs, minor breach of the Solicitor’s Rules or confidentiality. A “professional misconduct” includes gross overcharging, conflicts of interest, acting contrary to instructions, misleading or dishonest conduct in or outside court and a misappropriation of trust money, conduct outside the law practice such as conviction of a serious criminal offence, a tax offence or an offence involving dishonesty or being qualified from managing or being involved in the management of a corporation. The statutory institutions are not able to deal with complaints against courts staff, judges or magistrates or complaints against paralegals, law clerks, and individuals practicing without a practicing certificate, or about migration agents and licensed conveyancers. How can I file a complaint against my legal practitioner? Every complaint is required to be firstly assessed by the respected institutions in the state or territory you are in. If mediation between you and your legal practitioner is capable of resolution then this will be the first step that the institution will recommend to be done. This is a process where an officer from your institution will hear your side of the complaint and also hear your legal practitioner’s story in order to bring about a more practical solution where possible. This will be a confidential process, but if ever during the process, a more serious problem will occur the institution will investigate this further. If your complaint is with regards to professional misconduct, disciplinary action has to be taken by the institutions and a serious “investigation” is required. For an easier process, it is advisable that you call your respected institution’s Inquiry Lines (as provided above) to help and clarify questions you have about filing a complaint against your legal practitioner. To lodge a formal complaint the complaints must be in writing and must be signed by you or a person on your behalf. The name of the legal practitioner that you want to make a complaint against shall be written on your formal complaint. Each institution also provides a complaint form that can be downloaded from each of their websites or alternatively a letter with the details of your complaint can be sent to the institution in your state or territory. Any legal and relevant documents that you can provide to support your complaint must be photocopied. If you are acting on behalf of another person you must write the name of the person filing the complaint on the formal written document. If upon completion of the investigation of your complaint the matter was found to be a serious matter, the institution will refer the matter to a more powerful legal service that deals with lawyer’s professionalism such as the Bar Association. In each investigation the legal practitioner being complained about will be given an opportunity to respond to such complaint. Each state and territory has an online disciplinary registers database for the public’s reference, as required by the Legal Profession Act 2004. This is a list comprising of names of legal practitioners who have been given sanctions due to unprofessionalism. Below are the links to each state’s online disciplinary registers most recent listings. What other bodies help with the dispute? In New South Wales, the Law Society of NSW and the Bar Association also decides on formal complaints that clients file against their legal practitioners. If a disciplinary action has to be taken the Law Society Councils of each state review the complaints against solicitors and the Bar Associations reviewthe complaints against the barristers. They are professional bodies that decide on formal complaints that require an undertaking of disciplinary action. What is a likely hardship that I will face during an investigation process? A “Caesar against Caesar” notion has been attested when it comes to decision making made by the respected legal services that deals with complaints against legal practitioners. After your respected state’s legal services commission reviewed your case and requires a further investigation against the legal practitioner they will send the matters of complaint to a higher professional body. This could either be the Law Society for solicitors or the Bar Association for the barristers. The infamous Dr. Haneef’s case is an exemplar of such notion, wherein both his solicitor and barrister have been investigated at different times due to unethical conduct. They were both alleged of leaking substantial information related to the case. The president of the bar association stated that Dr. Haneef’s barrister was a regarded member of the bar and was to be presumed with innocence as he had acted honestly and with the best intentions. The bar association’s president also went to further discuss that the Bar Association does deal with such unethical complaints impartially for the main interest of the public. This is one issue in regards with filing a complaint against a legal practitioner, as eventually it is their own respected body that deals with their own complaint. A notion of bias is usually imputed in such process, as Caesar will not fight against himself. You have three (3) yearsfrom the happening of the alleged conduct to file a complaint against your legal practitioner. However, “out of time” case can be an exception if the Legal Services determine that “it is just and fair to do so having regard to the delay and reasoning of such delay” or if the complaint “concerns professional misconduct and that it is in the interest of the public to investigate such complaint”. Never be hesitant in filing a complaint against your legal practitioner if you truly feel that you have been given an unprofessional conduct. There are avenues ready to give you a hand and guide you through the process of being heard and actually getting a solution to a legal issue. This is a matter of obtaining justice and your case does matter.